UNITED NATIONS, July 6 -- Despite complaints pending before the UN's Office of Internal Oversight Services, the nomination by Secretary General Ban Ki-moon of Supachai Panitchpakdi for a second term atop the UN Conference on Trade and Development was confirmed July 6 by the UN General Assembly. Before the vote, the representative of Cote d'Ivoire, which fielded a candidate who as documented by Inner City Press was smeared by Supachai's senior advisor Kobsak Chutikul, read a speech expressing "reservations" at the process, stating that the "ethical values that should inspire our Organization were overthrown" by "defamatory practices against our candidate." Video here, from Minute 6:23. Today, while Ban Ki-moon is in UNCTAD's headquarters city of Geneva, Inner City Press publishes an additional July 3 e-mail by Kobsak Chutikul, and another complaint pending unacted upon before the OIOS. Inner City Press asked Mr. Supachai on June 24 to respond to his advisor's documented "game plan" of having UNCTAD staff lobby particular Ambassadors and spread negative information about the Ivorian candidate. Supachai said that because the complaint was before "the Office of Internal Oversight... we may have to defer to OIOS." Video here, from Minute 54:04. He denied that he had campaigned, characterizing it as a mere "re-nomination," essentially an automatic second term. On July 6, the Ivorian representative in the General Assembly dispute that this should be automatic, an argument that may be raised again in two years in New York. As Inner City Press has reported, this argument was made to Team Ban, that to allow the African Group to deny Supachai a second term would be a bad precedent for Ban. While Supachai on June 24 dodged questions about listening devices hidden in the UN in Geneva as well as the acts of his special advisor, while claiming that whistleblower protections are in place at UNCTAD, Kobsak Chutikul has since sent out the e-mail below. 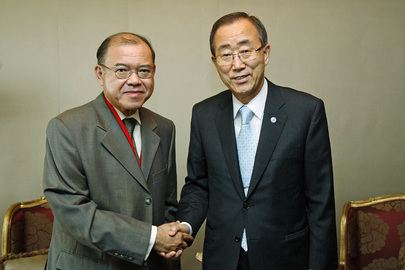 UN's Ban and UNCTAD's Supachai: when was the former aware of the OIOS complaints? Upon return from mission, I realise that recent press stories relating to me, as well as copies of emails attributed to me that have been widely circulated, have caused concern and bewilderment in the house. In my opinion, the context of those emails have clearly been distorted. Investigations will have to establish the facts. However, while awaiting the outcome of the investigation, at this point in time, I would like on my part to apologise for the damage that this matter may have caused to the good name and reputation of UNCTAD. I also deeply regret the embarrassment that has been caused to innocent third-parties outside the organization. Over the next few days, I shall be seeking to meet individually with those affected to apologise to them personally. Colleagues whose names have been associated with me all acted in good faith in what they must have perceived to have been the best interests of the organization, with no malicious intent. It has been a sobering experience. I shall strive to repair the harm done to this organization by the public disclosures of a complaint that was accompanied by incomplete and misleading information. I'm confident, nonetheless, that the organization will eventually emerge stronger from this period of relative trial and tribulation, as has been the case so many times in the past. I am an UNCTAD staff member with a wholly satisfactory UN service record, and I feel obliged to report a blatant recent example of poor management at UNCTAD, which is seriously troubling to many colleagues. While this issue may not concern me in the strict sense of my immediate employment or contractual conditions, it could have a bearing on the general matter of personnel issues at UNCTAD, something that all of us, programme managers and staff, have a stake in. I considered the options of either addressing myself to the Under-Secretary General for Management or the Secretary-General of UNCTAD himself, but I am concerned that such a formal open approach could subject me to retaliation, or otherwise be ignored. And as the Ombudsman's Office seems ill-equipped to understand and address such a matter, I feel that the safest, correct route to bring this to the attention of the concerned offices in the Organisation is through OIOS. Please find below the full explanation of this matter and attached some relevant documents. 1. I wish to bring to your attention the deep dissatisfaction among many UNCTAD staff-members with the decision announced on 19 September 2008 by the Acting Deputy Secretary General of UNCTAD to appoint Mr. Angelo Galindo as Officer-in-Charge of UNCTAD Human Resources Management Service (HRMS), effective 6 October. Mr. Galindo has acted since 2007 as Special Assistant to the Secretary General (for personnel and related administrative matters). 2. This appointment comes in the wake of a series of staffing re-assignments and appointments at UNCTAD that were arbitrary and undertaken without proper consultation with programme managers and concerned staff members or consideration of the impact on their morale and career prospects. This most recent appointment confirms that a pattern of faulty administrative decision-making at UNCTAD is tolerated, if not institutionalized. 3. This has created an environment perceived by many staff members to feature the same managerial impunity to which the Under-Secretary General for Management, Ms. Angela Kane, took exception in her recent UNOG Town Hall meeting. Regrettably, the various administrative, oversight and inspection mechanisms intended to uphold good management and safeguard staff-member's rights that Ms. Kane stressed at that meeting are not working as they should or else I would not have felt obliged to report this confidentially to the Ombudsman. 4. This appointment is problematic because of the official public record of the staff member's service with the United Nations. Mr. Galindo brought a case to the UN Administrative Tribunal (UNAT) appealing against disciplinary action taken against him by the Secretary-General of the United Nations, following a 2002 ruling by the UN Joint Disciplinary Committee (JDC) (UNAT Judgment 1151, Galindo- copy available on the UNAT website). 5. In 2003, the Tribunal accepted that part of Mr. Galindo's appeal that contended that the penalty to which he was subject was disproportionate to the offenses that the JDC concluded he committed. The Tribunal did not pronounce itself on the offenses ascertained by the JDC nor did it accept other parts of Mr. Galindo's pleas. But it did conclude that Mr. Galindo "should be granted priority consideration for any position at the level for which he applies and for which he is qualified". • "….a blatant lack of integrity and that the staff member's position as Chief of Personnel of UNCTAD constitutes an aggravating factor". 7. When he informed the staff-member of the disciplinary action that he decided in March 2002, the Secretary-General of the United Nations stated that he had "given careful consideration to the findings of the Committee and has concluded that the charges that (he) committed theft and discredited the United Nations are well founded and that (his) conduct constituted a serious violation of the standards of conduct and integrity expected of each staff member of the Organization, aggravated by (his) official position as Chief of Personnel of UNCTAD". 8. The Secretary-General decided that "due to the nature and seriousness of (his) misconduct, (his) demotion will be with no possibility of promotion and would entail a reassignment to an environment where (he) shall no longer exercise decision-making and managerial responsibilities…"
9. UNAT subsequently determined this disciplinary action to have been disproportionate to the offense, despite acknowledging his "bizarre behavior" under stress. While, UNAT ruled that Mr. Galindo should be considered for any post "for which he is qualified", the other facts of his record are not disputed, in particular his proven lack of integrity and other attributes especially important for the incumbent of such a position. 10. Notwithstanding Mr. Galindo's special skills in the area of human resources "management", the official observations about his competencies which are part of the public record do not reflect the qualifications and standards of integrity and leadership expected from somebody placed in charge of personnel matters in any United Nations Department. 11. While everybody should be given a second chance even when they fail, this staff member has been compensated fairly for any unfair decision to which he might have been subject, first by being returned to his former (P-4) grade, not to mention having been promoted to his current post at the P-5 level. 12. However, awarding this staff-member line functions in areas where he can exercise decision-making and managerial responsibilities flies in the face of the standards that we are all expected to observe as United Nations staff members and to which the Secretary-General of UNCTAD personally committed at the outset of his term in the form of an "Integrity Statement". Indeed, UNCTAD staff find it difficult to believe that the Secretary-General of UNCTAD is aware of the specifics of Mr. Galindo's record, or else he would not have approved his assignments since 2007 in the area of human resources management at the recommendation of his senior advisors. Of Mr. Galindo, another UNCTAD whistleblower states that "the Dr. Supachai/ Chutikul-administration did its best to revert a tacit understanding that he must not be allowed to handle (again) personnel matters. He paid back by helping Mr. Chutikul to recruit Mr. Bautista, former First Secretary at the Mission of the Philippines in Geneva, now one of the gentlemen of the game plan e-mail exchange, to a senior post at UNCTAD and thus saved him from a pending reassignment to Vietnam." Is this any way to run an Organization? Some now question, when, even before Inner City Press asked Ban's Spokesperson and wrote about them, was Team Ban aware of these pending complaints and what has been done about them? Watch this site.